Good evening there friends, family, and loved ones this is Team Pancake reporting in from Low Camp on Mount Vinson (about 9,500 feet). Fear not; once again we’re letting Mr. Vern Tejas rest his voice and use it for our climbing expedition rather than calling in for cybercasts. We had a great today here in Low Camp. We took a rest day. The weather was beautiful sunshine. And don’t be scared by the term “rest day”. We did get out and stretch our legs quite a bit. We did a little rope rodeo working with our ascenders on a simulated fixed line, preparing for our next move which would be a carry up to High Camp. 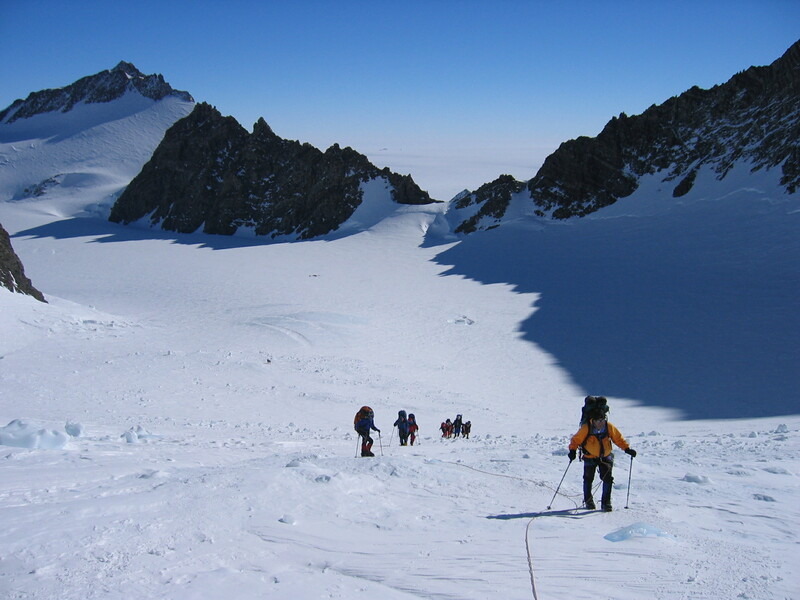 So we’re going to ascend the fixed lines and hopefully move some of our gear and cache it up near High Camp tomorrow. And then potentially have the opportunity to move up to High Camp the day after that. So got out, stretched our legs, and also went up to the Col to take a view down on the pyramids. So it was a beautiful day. We tried to stay out of the sun as much as possible and enjoyed ourselves. We just finished up a great dinner and we’re getting ready to head to bed. I’m just going to leave you with one parting question: two engineers, two lawyers, and a mountain guide walk into a bar. How do you identify the mountain guide? I’m going to let you guys think about that and we’ll follow up and you’re just going to have to tune in to find out what the answer is. As Mr. Vern Tejas would say “ciao for now”!